Cheers to Friday, friends! What’s on your weekend agenda? I’ve got a shopping date with Mama Sugarplum, and a long overdue date night with the Mister! And of course, more rain…because it won’t. stop. raining. Fine by me though, just an excuse to binge more episodes of This Is Us! 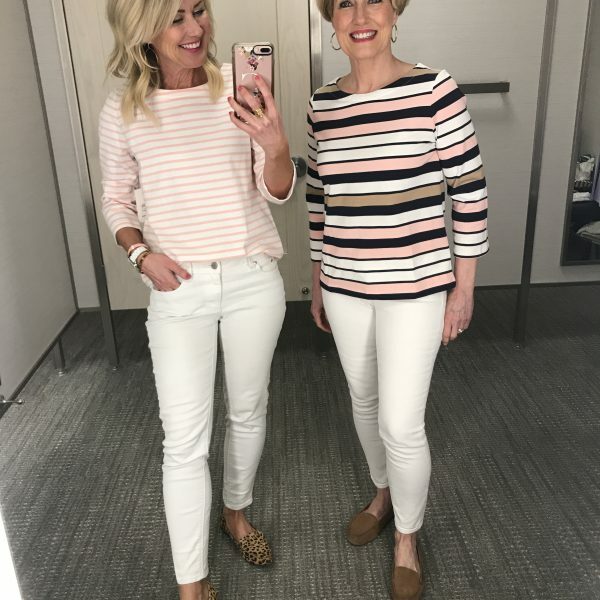 Today I’ve got a new Dressing Room Diaries…you know the drill…I hunt down some of the cutest new arrivals from my favorite retailers, and review them for you. The shots aren’t good, the lighting is bad, my hair is usually past it’s expiration, and many of the items aren’t a good fit for me…but it’s real life, real girl, real clothes…and hopefully helpful for you to see them this way, instead of perfectly styled on a model. Fit Note: I’m 5’4″-ish, 120 pounds-isa (depending on the week’s taco count), with a slight pear shape. My usual size is an XS/0. 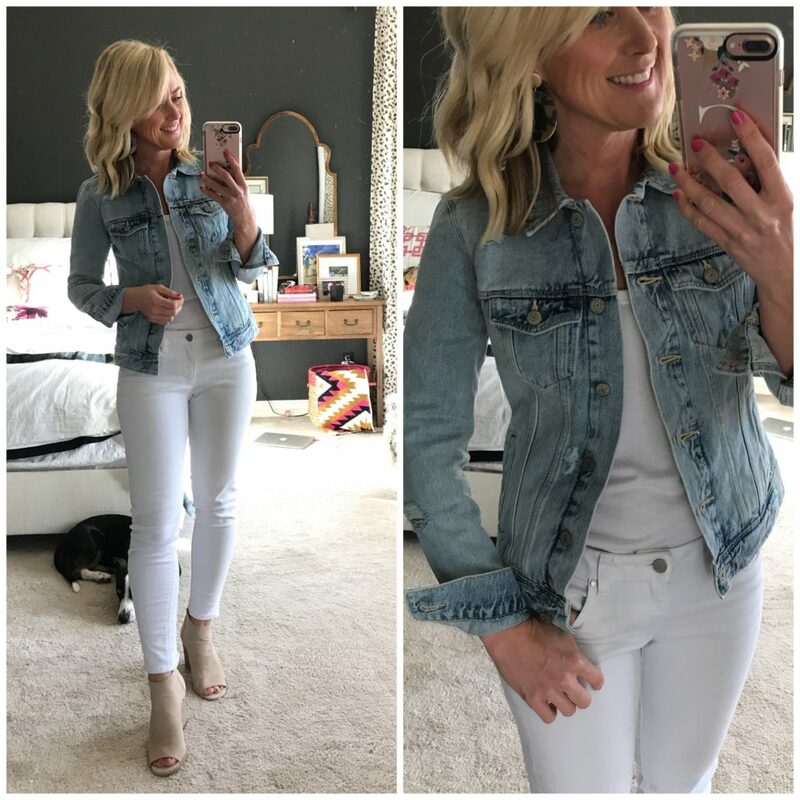 Let’s start with light jackets, my wardrobe lifeline this time of year…I found several super cute options, starting with this distressed jean jacket. I love the light wash, and the slight wear gives it a well-worn feel. It’s a great fit and length for jeans, pants, skirts and dresses. And the price is unbelievable, especially for the quality. 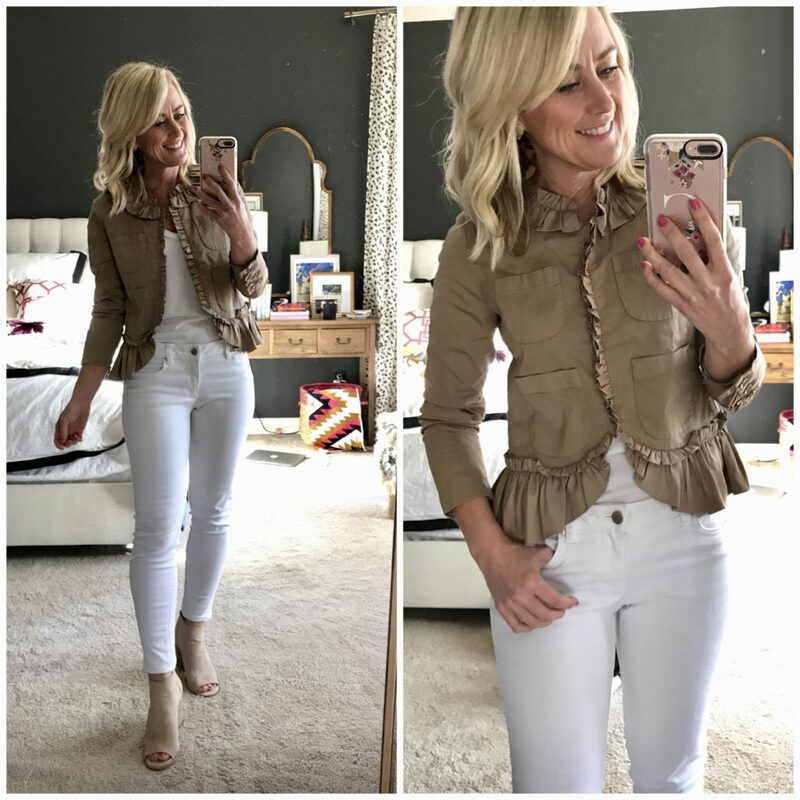 This ruffle-trim jacket makes me wish it were Spring right now! Like yesterday! It’s a cotton chino with ruffle trim along the edges and collar, and fully-lined. It has a touch of stretch and looks cute worn open or closed. I’ll wear it with jeans, pants, skirt and over dresses. The peep-toe booties are a perfect neutral, with a comfy block heel. 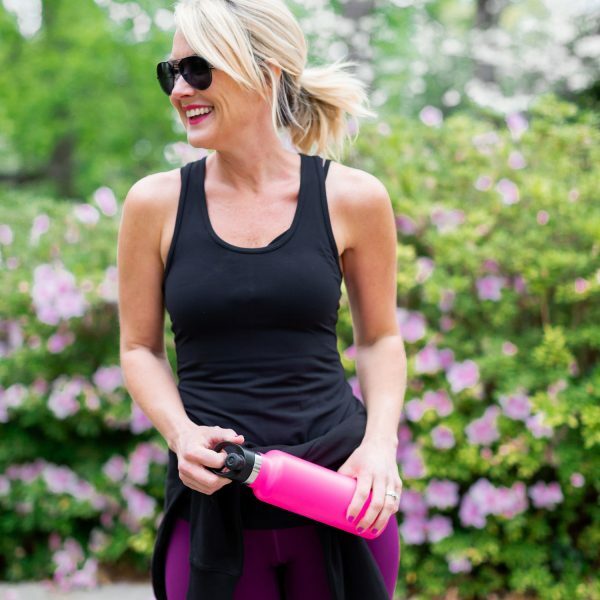 Fit Tip: I’m wearing a 0, and it’s a good fit over light tees and sleeveless tops. It’s a little snug over long-sleeves, but I prefer the shrunken fit of the smaller size. The shoes are true to size. 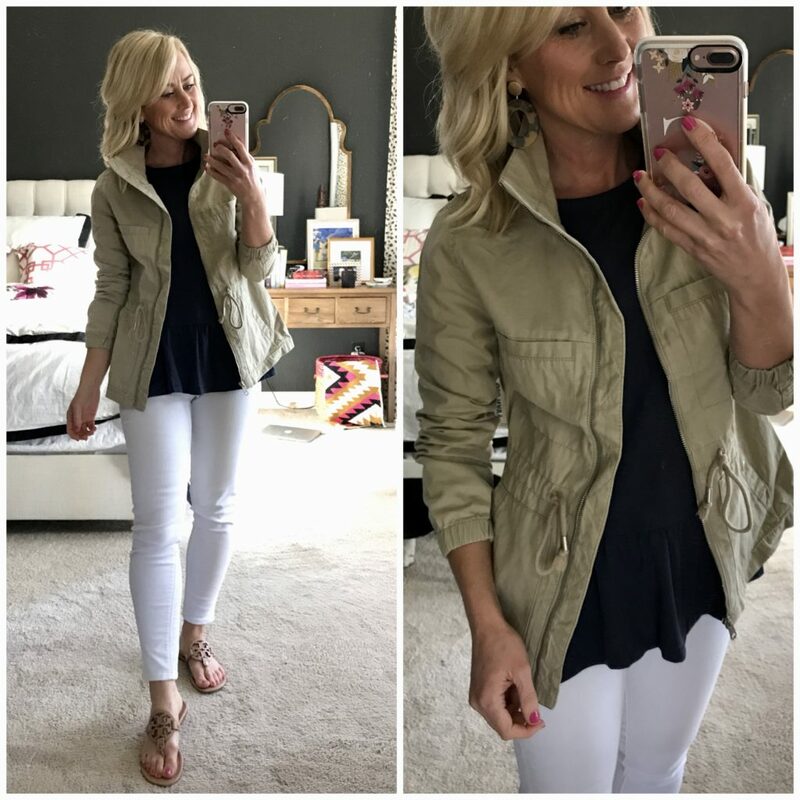 Y’all know I love this jacket…you’ve seen me wear it in camo and blush already…and I couldn’t resist this light sand color for the price! The drawstring waist allows for a flattering fit, and I love the tall collar (you can wear it up or folded flat). The peplum tee is a favorite from last year, and back in a ton of great new colors. It’s jersey soft, and a relaxed fit. 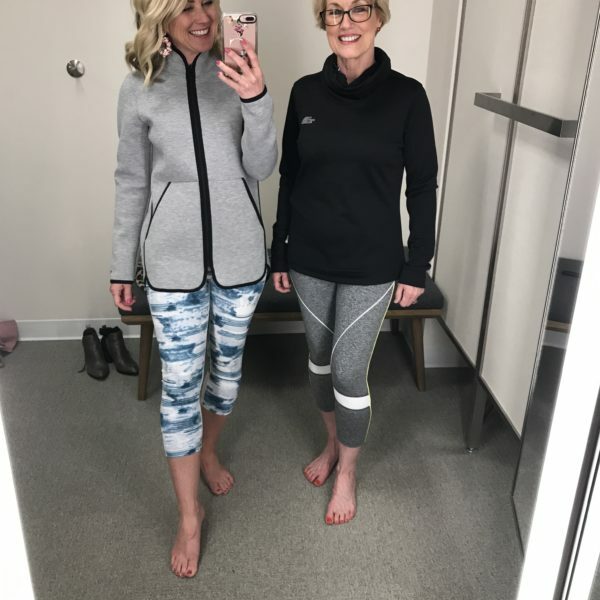 Fit Tip: The jacket and shirt are true to size, I’m wearing an XS in both. Moving on to dresses…let’s start with this darling faux-wrap! It’s a gorgeous cobalt (comes in two other colors, as well) with an ultra-flattering wrap fit with nipped waist and fluttering ruffle trim. It’s great with flat sandals or wedges, and even dressed down with a jean jacket. Fit Tip: I’m wearing a regular 0. Petite sizing available, too, but I prefer the longer length of the regular for myself. I felt a little like a cupcake in this dress, then Mr. SP walked in and gave it two thumbs up, so obviously it has some boy power! It’s a thick, taffeta-style material that’s sturdy enough to hold you in, and keep the ruffles from deflating. It comes in several colors and would be so cute with statement earrings and heels for Spring and Summer parties and weddings. The wedges are a darling blush and tan color block, and on super sale! Fit Tip: I’m wearing a regular 0, and it’s a tad big in the chest. 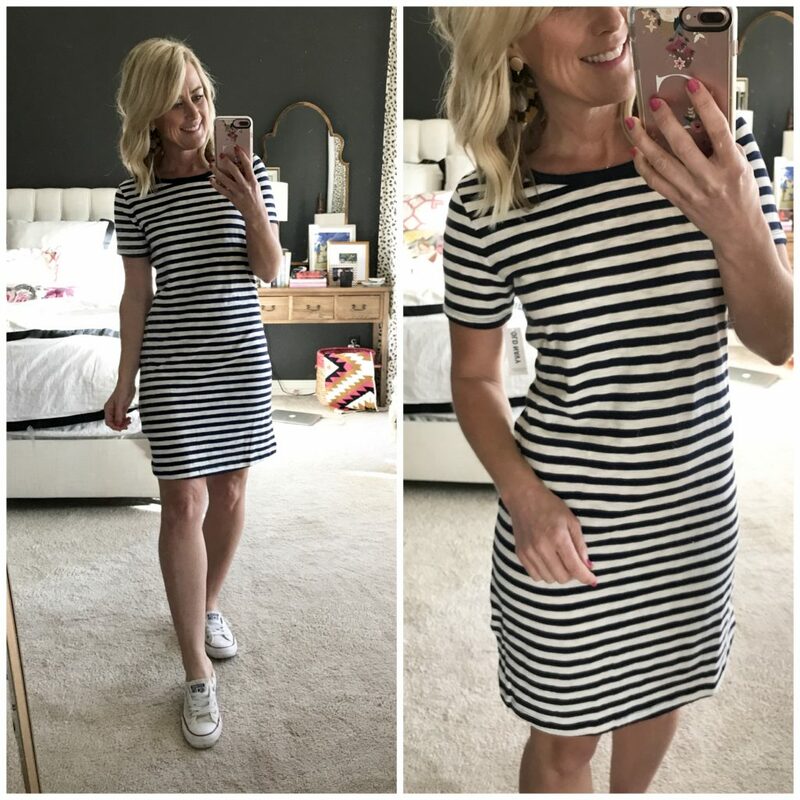 Go ahead and grab this dress now…I promise you’ll thank me this Summer! It’s so easy with sneakers or flat sandals, and even thrown over a swimsuit. I love that it’s a little longer, and the cotton is sturdy enough to conceal lumps and bumps. Plus, it’s under $20! 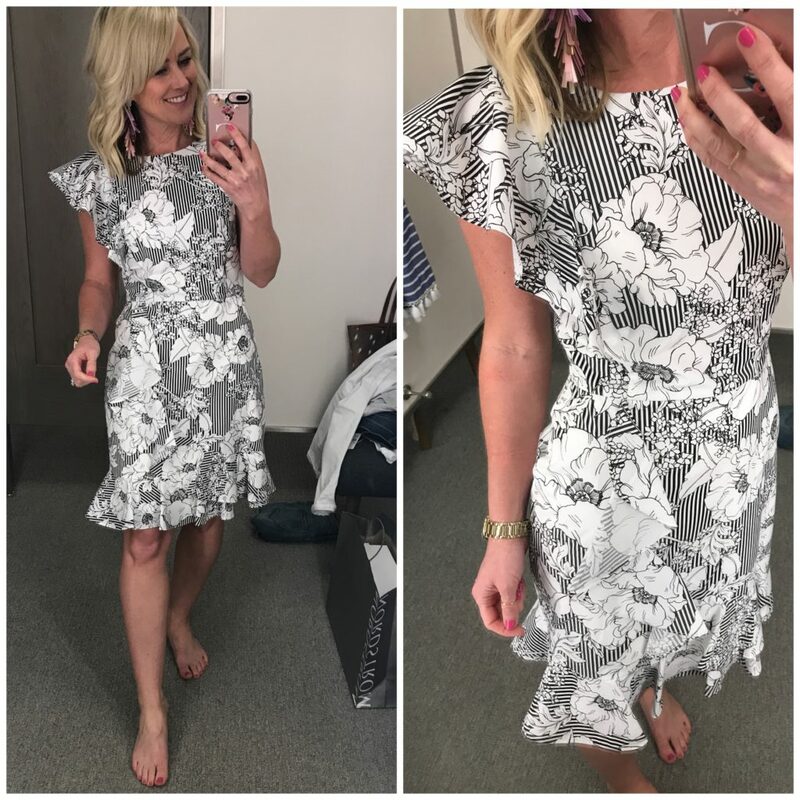 Clearly ruffles are big again this season, and you won’t hear my complaining! I love girlie details. This pattern is a combo of stripes and floral, giving it a graphic feel that’s not too sweet. 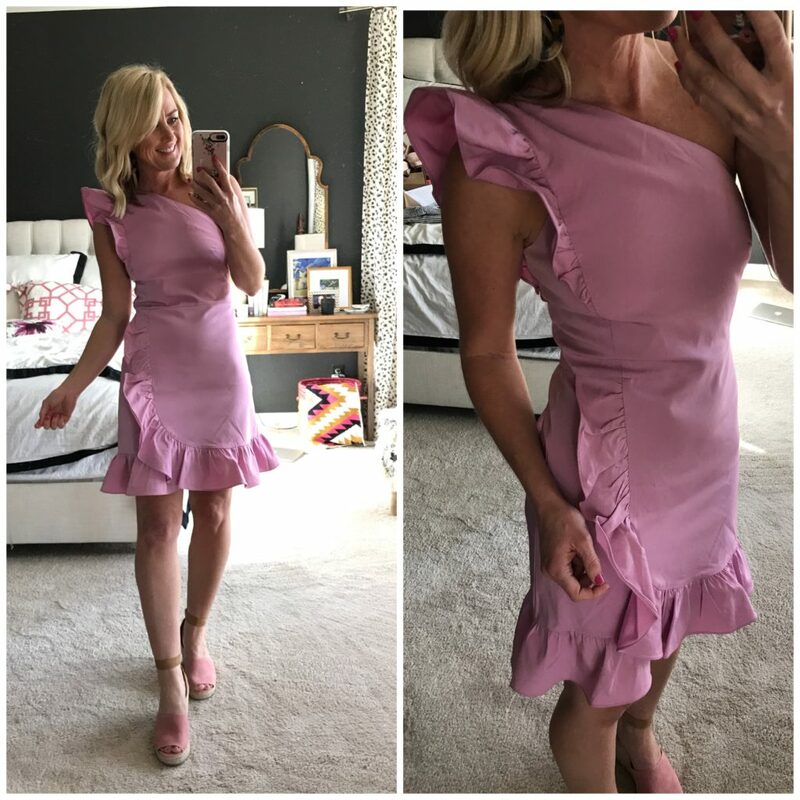 The ruffles are well-placed for a flattering fit, but it’s not lined and a tad on the thin side. The material is crisp, so the ruffles hold their shape. Fit Tip: I’m wearing a small, but needed my usual XS. 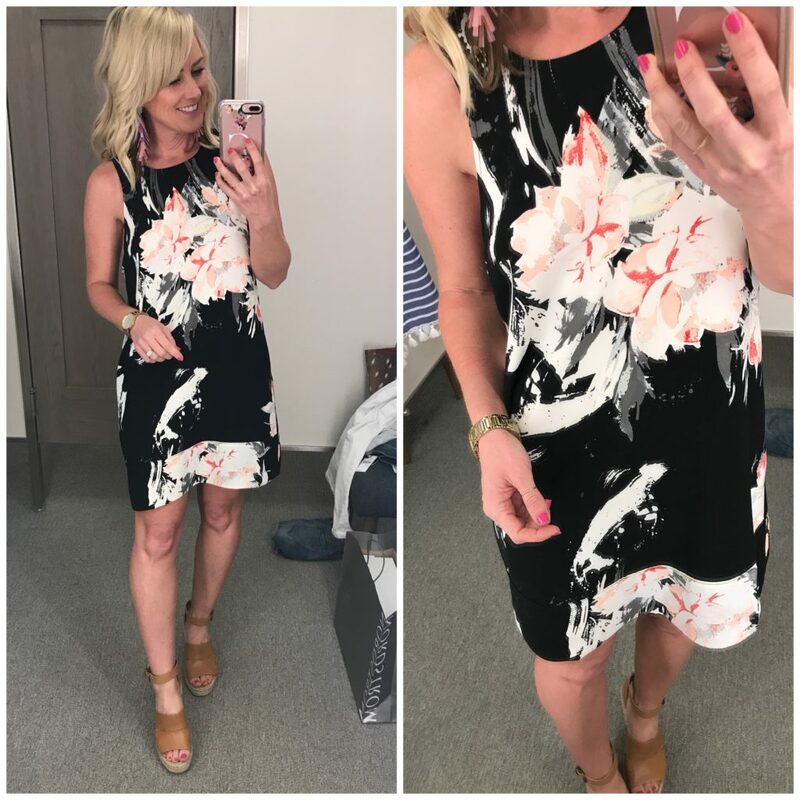 My favorite racerback dress from the last several years is back, and now comes in this abstract floral! This one is fully-lined (unlike the solid colors) and has great movement. 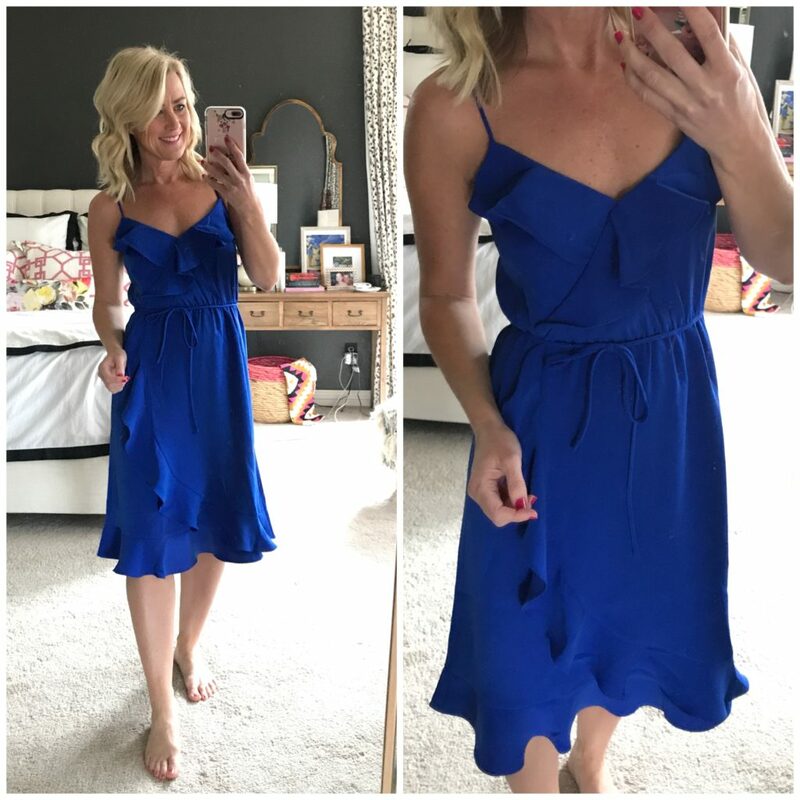 I have this dress in several colors, and wear it with everything from heels to flip-flops, and it packs like a dream! 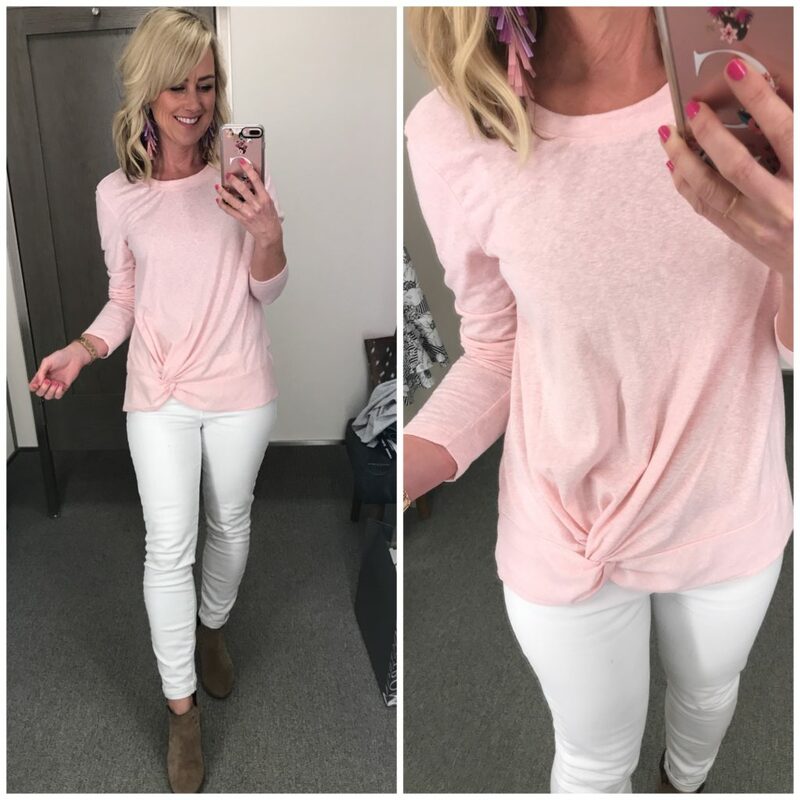 These are the wedges I talked about in this week’s Q&A post…they’re pretty much perfect! My picture doesn’t do this skirt justice, it’s got a subtle dot pattern that gives it a little texture, and has an extra layer to give it some flounce. It’s light chiffon and fully-lined, with a pull-on fit and elastic waist. The a-line shape is flattering and forgiving! I styled it with the distressed jean jacket, but you could easily dress it up for work with a blouse, too. Fit Tip: It runs large, so size down one if you have a small waist…I’m in the 00. 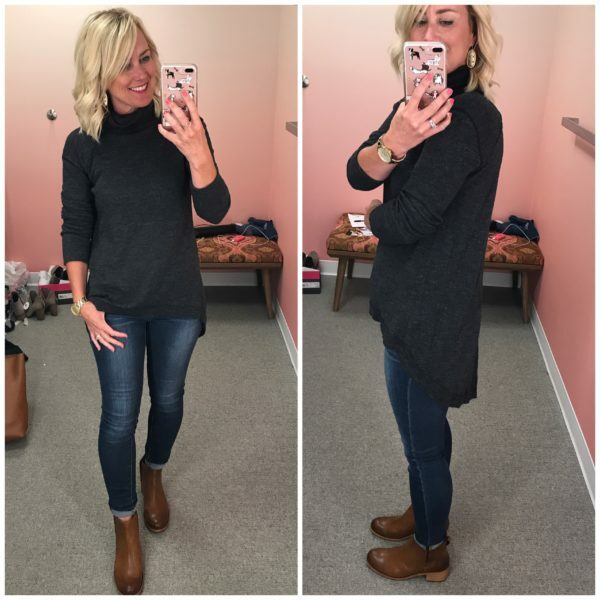 This gorgeous cashmere is already under $100, and now an extra 30% off! It comes in so many lovely colors, is super-soft, and dresses up and down. I love to pair them with colorful statement earrings…and of course, a utility jacket! 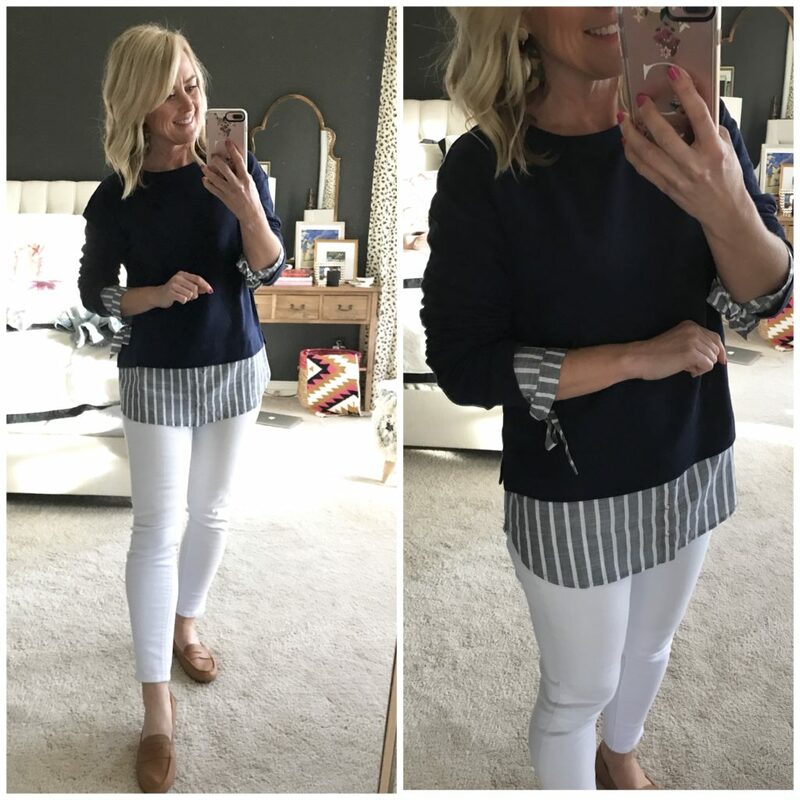 Fit Tip: I size up to a small for a more relaxed fit. This silk utility blouse is a closet staple…wear it with jeans for weekend, and with slacks or skirts for work. I love the double chest pockets and roll-tab sleeves. It comes in several solid colors, and this fun stripe. 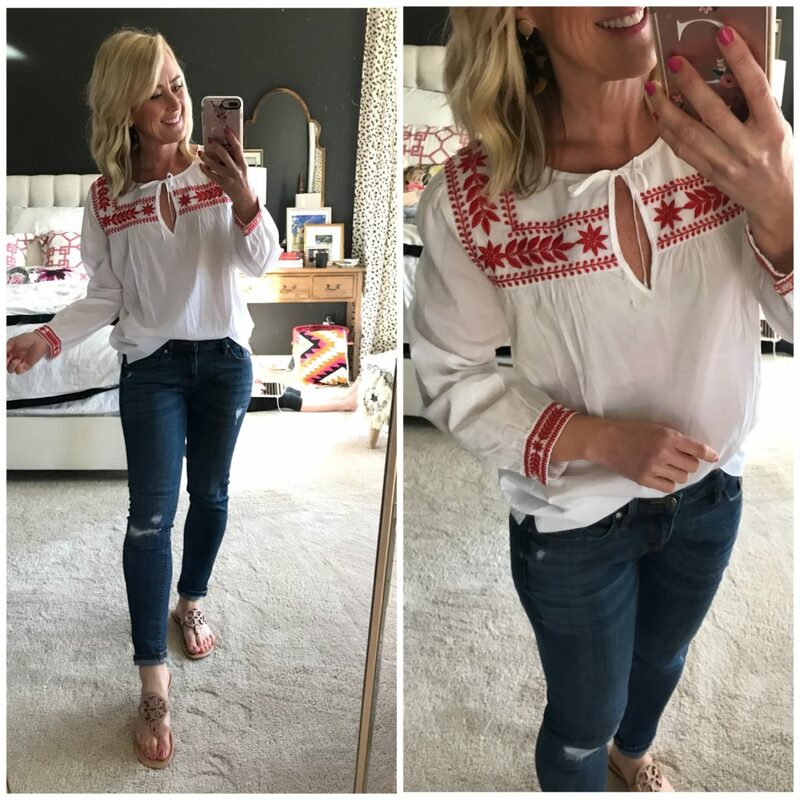 Hello, darling embroidered top!! The thread is a coral-red, and the top a lightweight, yet crisp, cotton. I love the embroidered band at the wrist and little tie closure. It’s a tad sheer, but not so much that you need a cami. Fit Tip: It’s a full, relaxed fit…I’m wearing an XS. You’ve seen this sweater several times…it’s a favorite crewneck for all seasons. I layer it under jackets and over collared shirts, and wear it alone with jeans and skirts. It comes in tons of colors and I have a weakness for them when they go on sale (like now!). Fit Tip: I size up one to a small for a more relaxed fit. Fit Tip: It’s a generous fit, I’m wearing XS. A basic long-sleeve tee with a twist…literally. It’s a lightweight cotton blend with a wide band at the hip with a twist style that gives it a half-tuck look. Plaid isn’t just for Fall, especially when it’s a gauzy cotton with darling shades of blue. I love the crisp collar of this one, and the step-hem is fully-finished so it can be worn untucked without looking sloppy. 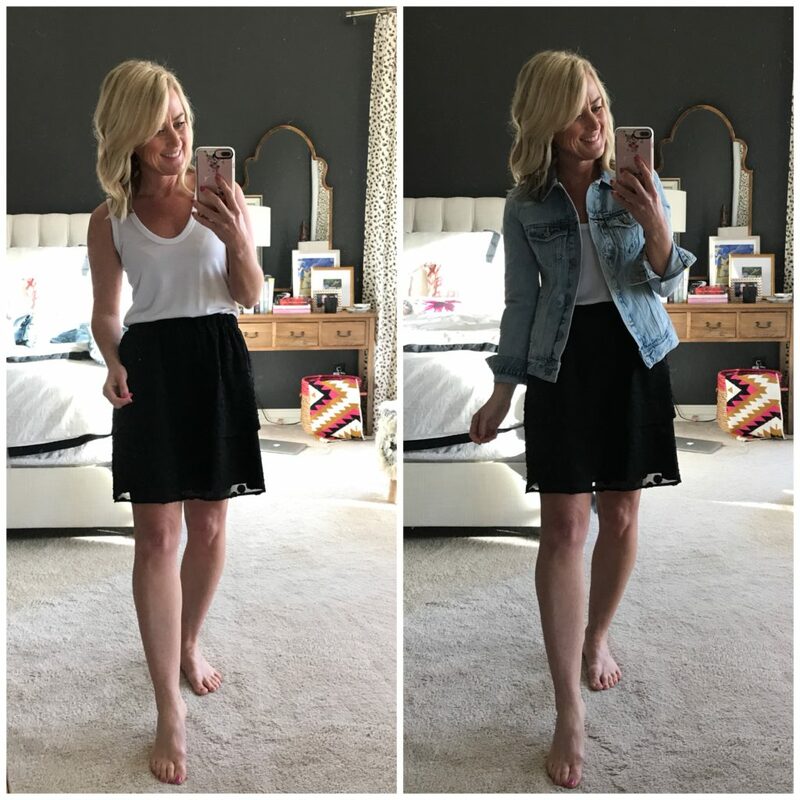 Denim cutoffs were one of the most-requested items last Summer, so I started my search early for you this year…and so far, these are in the lead! I prefer my shorts without a cuff (it can add bulk around the thighs…ain’t nobody wants bulk on the thigh! ), and these have a great frayed hem with just a tough of distressing (but no holes). They’re not too low-rise, and have a good amount of stretch. They’re also a sturdy denim. Fit Tip: They do stretch out, but I prefer my jean shorts to be a little loose, so I stuck with my usual size of 26. 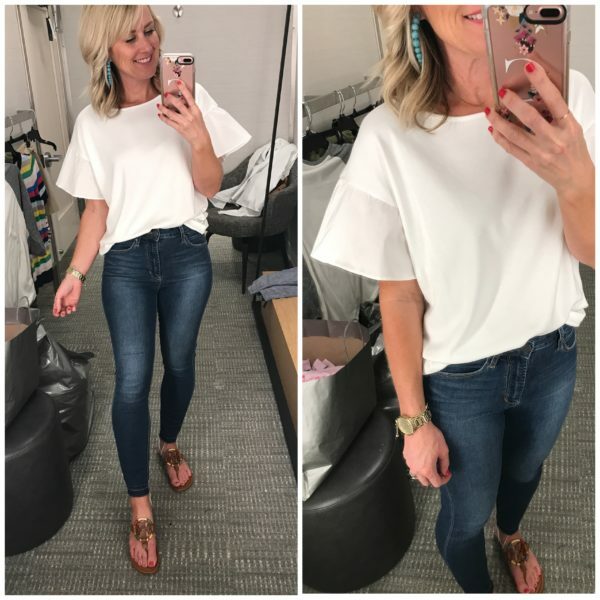 Jeans + tee + sandals + statement earrings are pretty much my Spring uniform…it’s so easy and comfy, yet still stylish. 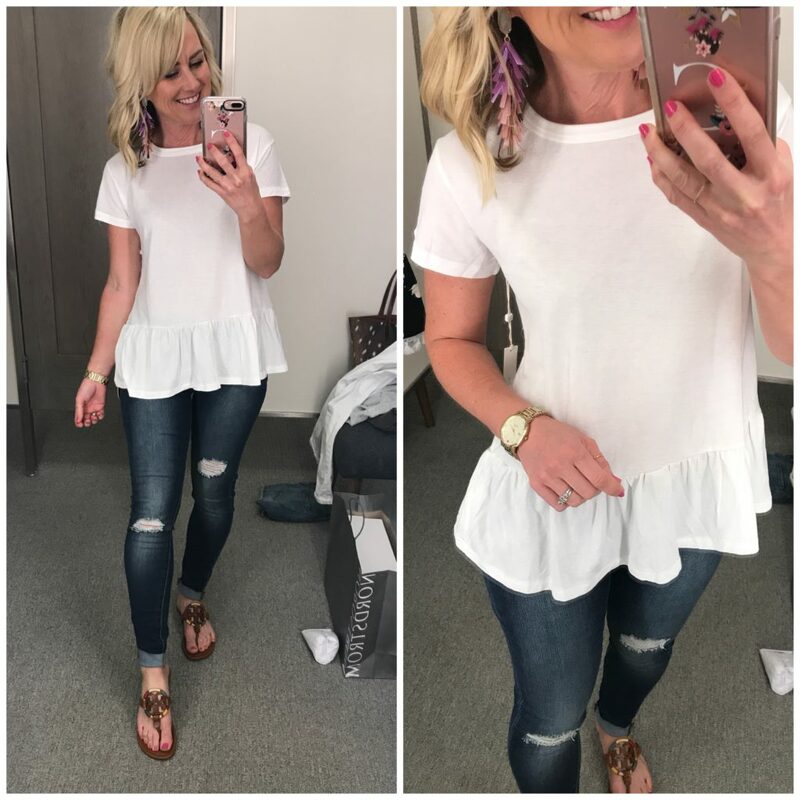 I found two new white tees that will be in heavy rotation these coming seasons, starting with this peplum. It’s insanely jersey-soft, with a fun peplum hem for a little sass. I like that the peplum hits lower on the waist (higher peplum can sometimes look maternity). 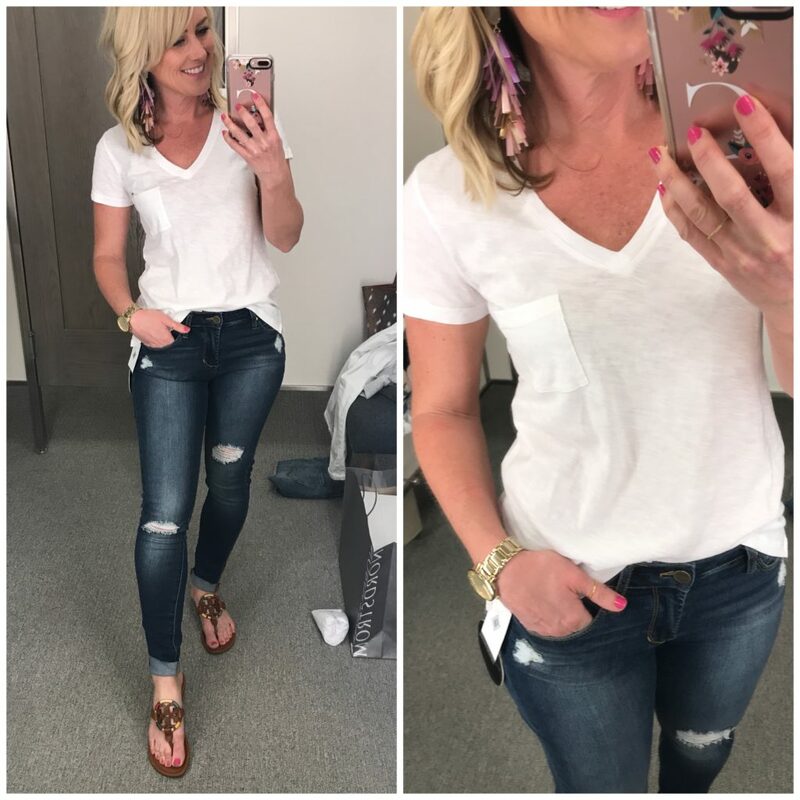 These are the same distressed jeans I raved about in my last DRD…crazy soft and stretchy with a comfy mid-rise…perfect for sandals and wedges! 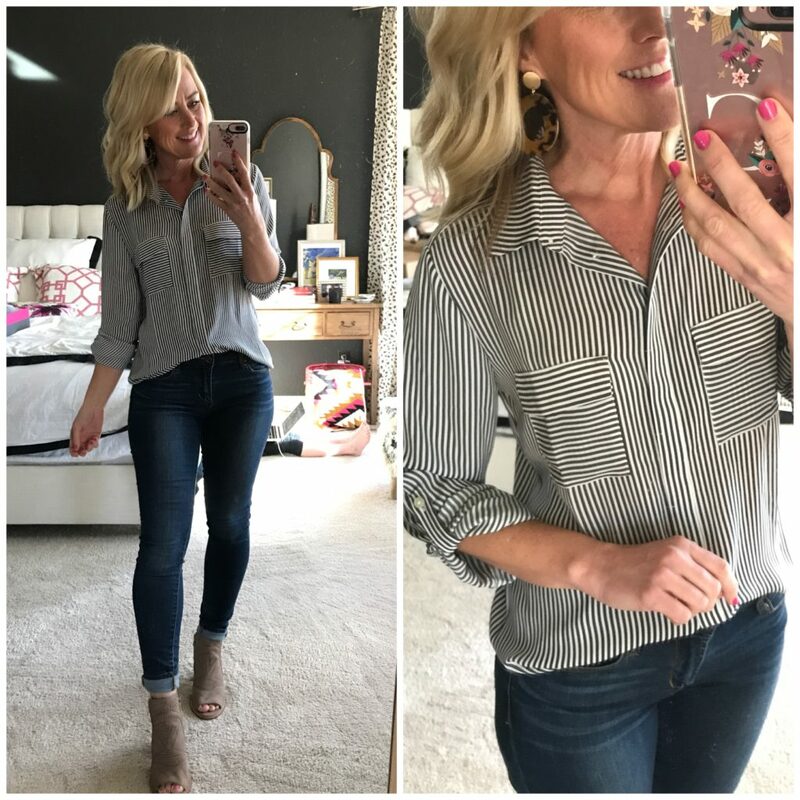 Fit Tip: I’m wearing an XS top, and sized down one in the jeans to a 25. They start out snug, but do stretch out! 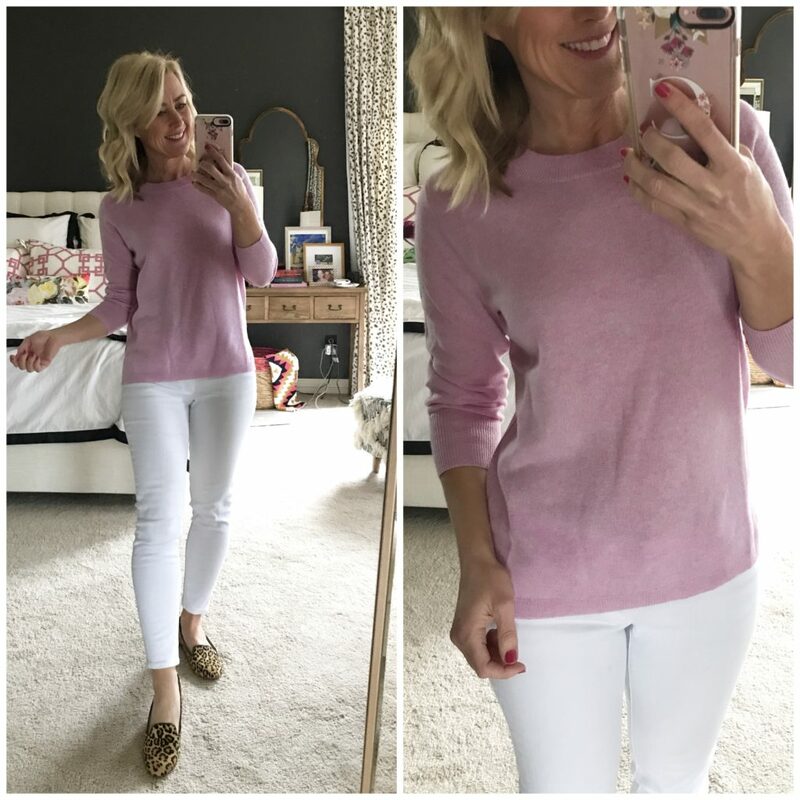 You know I love this scoop neck tee (I styled an entire Five Ways around it! ), but I’ve had requests for different styles, and this v-neck is my favorite so far. It doesn’t dip too low and has a great, longer length and a pocket. It also comes in a ton of colors, so you can stock up! Fit Tip: I’m wearing an XS, but it feels a little snug in the shoulder and arms, so I’d recommend sizing up one. Okay…moving on to shoes! 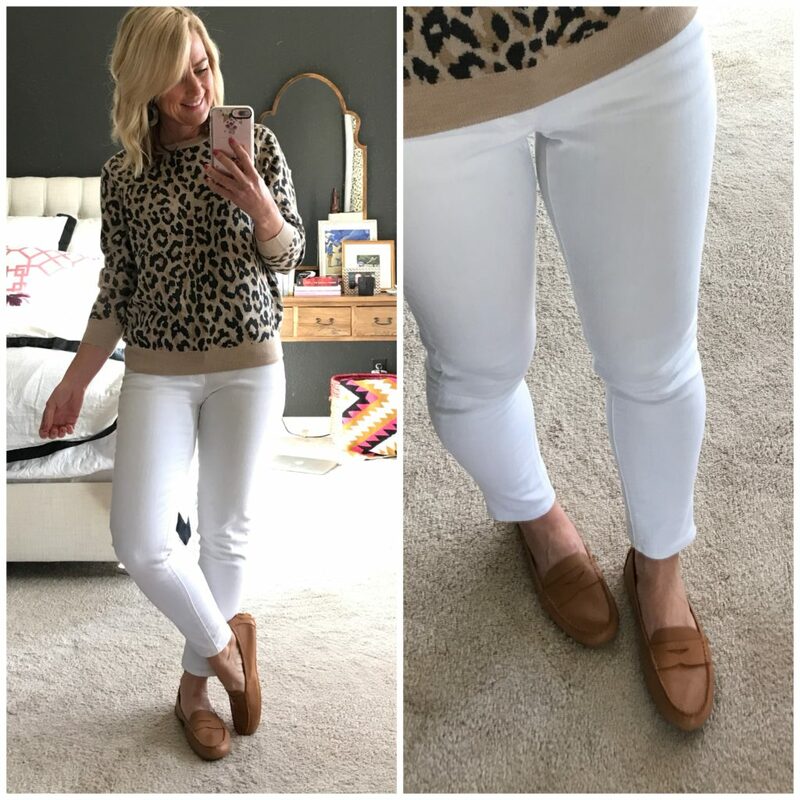 I’ve had a lot of requests for flats, and you already know I love this leopard pair…and now I’m obsessed with these moccasin loafers. They are buttery-soft with an extra-padded footbed and comfy rubber driving soles. They honestly feel like slippers. They come in a ton of colors and are under $100. Fit Tip: I’d recommend sizing down half. As for sandals, I’m already a huge fan of these sandals (I wore the uber-neutral ‘Makeup‘ shade approximately 187 times last Summer), and was drawn to the darling embroidery of these, plus the rich cognac color. 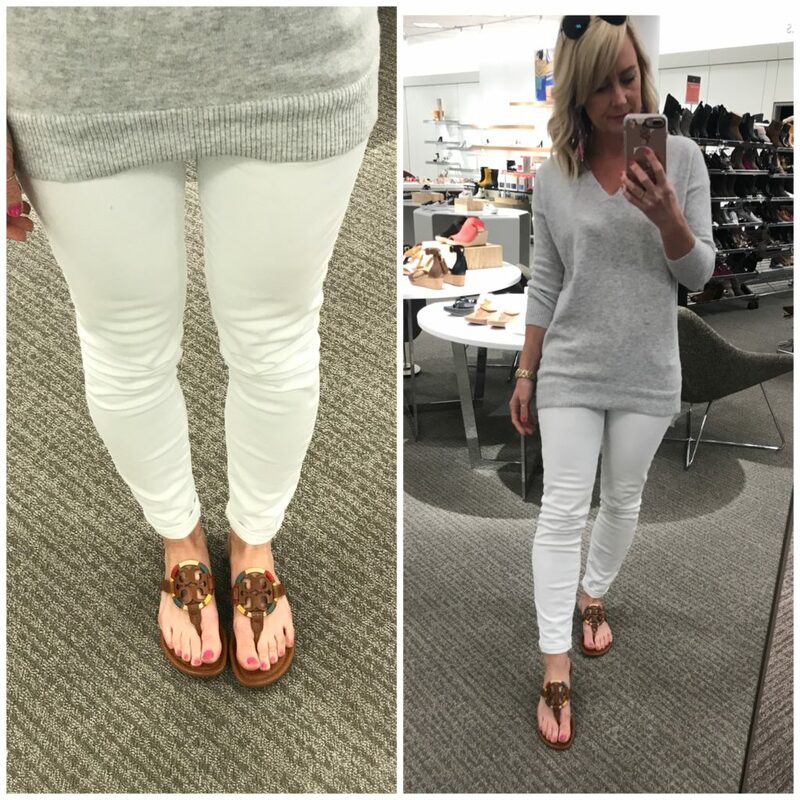 This sandal is honestly the best shoe investment I’ve ever made…they go with absolutely every thing, and make every outfit impossibly chic! Sidenote: I find the leather ones much more comfortable, but the rubber styles could be worn at the beach or pool. Fit Tip: I size up half in them. 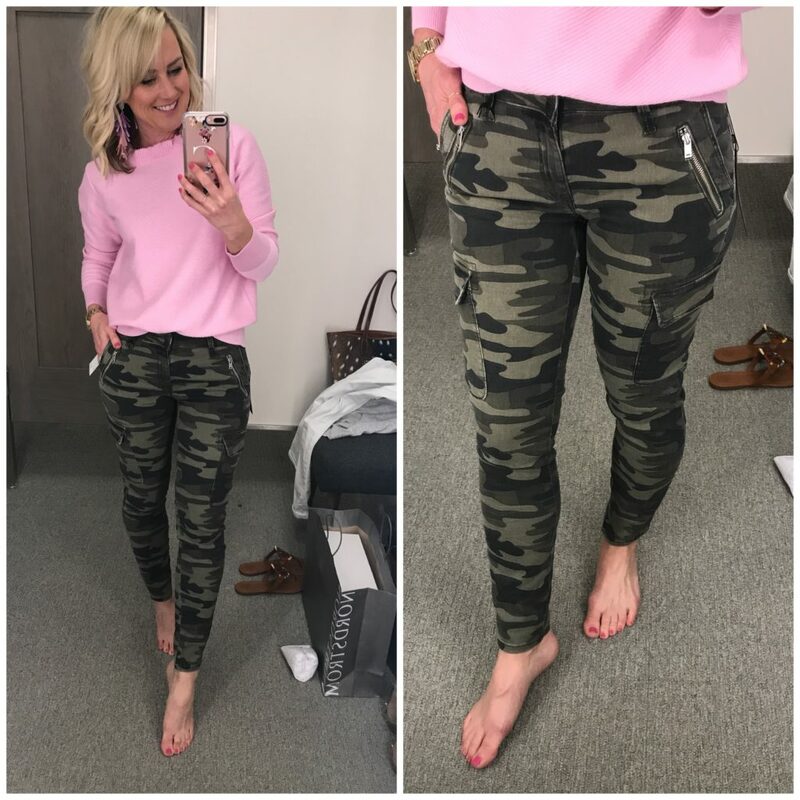 Okay, we’ll end this post with my favorite find of the week…these camo cargo pants and pink ruffle sweater! I’m sure it won’t be long before you see this look fully-styled on the blog! 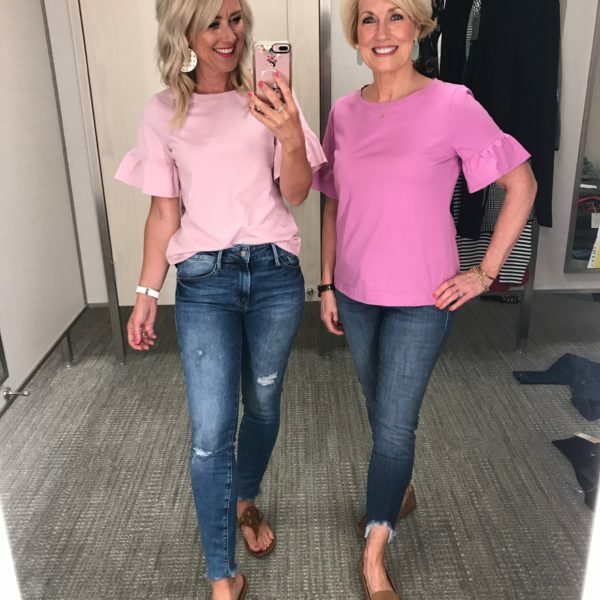 I’m crazy for the zippers and cargo style of the pants, and what’s not to love about pink ruffles?! The pants are sturdy with just a touch of stretch, and a great ankle length. I’d also wear them year round. Fit Tip: Both are true to size…the pants were a little snug at first, but loosened up quickly. Okay, that’s it for today! I do hope you found it helpful, and maybe discovered some new goodies and styling ideas! And see below for the latest sales happening today, like . What’s your favorite from this round of Dressing Room Diaries? Happy weekend, lovebugs! 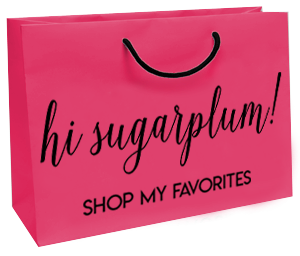 NORDSTROM // Huge seasonal sale, like 50% off peep-toe booties & Hunter rainboots! Only Cassie can get away w/horizontal stripes-cute! I always look forward to reading your blog! Our tastes seem to match up (love that btw) and I’ve gotten many of items you’ve posted. I already own a denim jacket and a polka dot flounce skirt. Looking forward to re-creating that outfit this spring. What shoes would you wear with this outfit? I’m thrilled to hear that, Kerri! I’d wear a neutral wedge or sandal, or maybe even black flats. Love it all! Except one thing—the ruffled jacket that you show open and closed. The upper pockets are way too high on you. It looks like a child’s jacket. Everything else is great! Thanks for sharing. Would love to know more about your date night ideas, and places you visit. Food, fun, etc. Hi Melanie!! I actually have a Big D category under my Travel tab!! (Check the navigation bar) I haven’t added to it in awhile, but I usually include restaurants, etc at the bottom of each post. Hmmmm, that’s a good question!!! The Halogen is a tad thinner and longer…so I’d choose depending on the fit and weight you prefer! Also, the Halogen neckline is a tad wider than the J.Crew. Some cute items! Curious about the fabric of the pink ruffle sweater at the end. I see it has wool in it. Is it itchy? Oh really, I would have never guessed! It’s not itchy at all! If you’re in-between sizes or have a larger chest, I’d size up though. 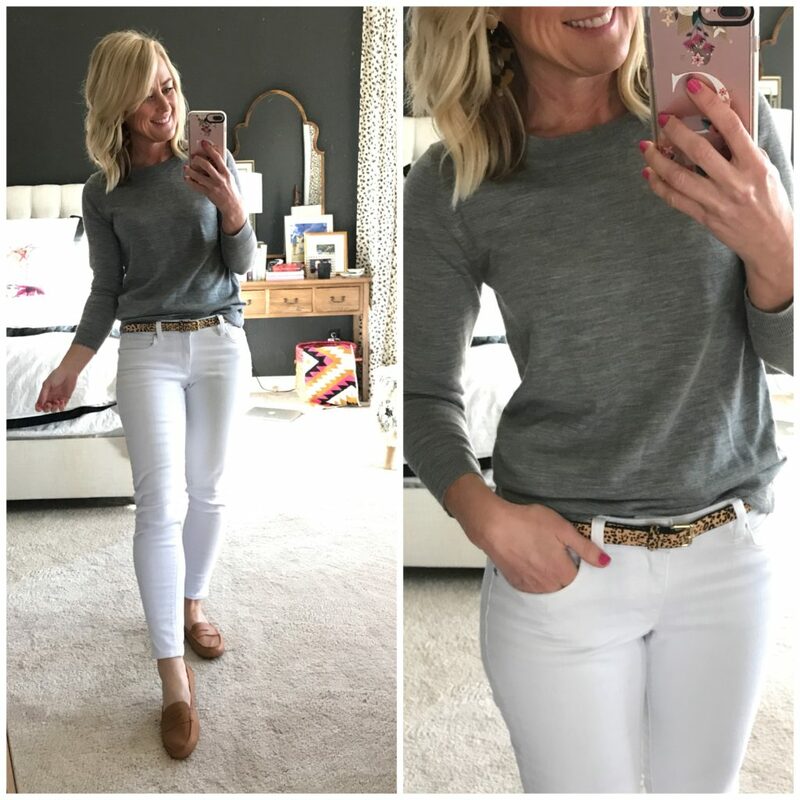 I went from 0 to 3 Tippi sweaters from J Crew after seeing them on you! Thanks for the detailed sizing information on all items. Thanks so much, Laura!! Enjoy your beautiful Spring weather!! I’ve seen so many reviews to size down. Thanks for any input! Oh crap!! I just double-checked my shoes and I did size DOWN half!! Ack, so sorry!! I’ll update the post!